Kiki Beelitz visited Floriscount at his birthplace and home Gut Fuechtel. There he lives out of the breeding season and is cared for and kept fit. Kiki made a great movie to show us Floriscount’s daily life. But see "Floriscount in private" for yourself! Together with the stallion station Pape we could bought the catalog number 65 of the Hanoverian stallion licensing. This amazing stallion by Franklin – Ehrentanz – Florestan I (breeder: Gestüt Greim, Bärnau) delighted the expert audience and us. We are very excited about the further development of this youngster and we are happy to offer you this top stallion! 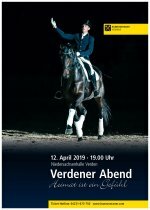 The price peak of the jumping foals at the Oldenburg Elite Foal Auction in Vechta was presented by the winner of the OS licensing 2015 - Diamant de Quidam. The winner of the Vechta foal championship "Don King" v. Diamant de Quidam - Contender - Cassini I, bred by Johannes Heinrichs from Heinsberg, moved to a top-class show jumping stable for 55.000 Euro. Congratulations! Last weekend an international hockey tournament took place at Celle. The team of Slough/GB has visited the State State Stud before. King George II the founder of the Stud was King of Great Britain as well. We are proud that our employees always do painstakingly work to bring our historical buildings back to former glory. Last winter we restored our “Bergstall”. Thank you guys, you did great work! 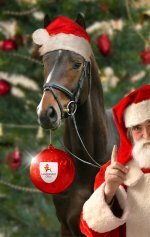 Qualified stallions for "DKB-Bundeschampionate 2017"
Lots of stallions are qualified for "DKB-Bundeschampionate 2017"
So many foreign breeders ask for our popular Edward. We decide that he got quarantaine. Now he is available for every foreign country. More information about Edward find here.